I take it with the hard skimmer hose there's a minimum speed you have to maintain to induce a feed-ram effect? Does the water spray effects work irregardless if there is no water? In other words are they dependent upon finding some water to dip the hose into? I had to refresh my memory by looking at the code and yes it requires velocities/airspeed-kt >25 which I plan to change to ground speed as that would be the appropriate measurement to use. There is also a maximum (velocities/airspeed-kt >35) to use the snorkel, any faster and it wont stay submerged enough to suction the liquid. Eventually the plan is to have a maximum ground speed that can be used before damaging the skimmer or if the skimmer is engaged over land at a low enough altitude. The particle effect is tied to the volume in the tank so no liquid in the tank = no effect or wildfire suppressant discharged. The tank is filled either by skimming in water, snorkeling in water or using the GUI slider regardless of being over water. If I can make a suggestion for a widget or some sort of bar-graph in the features box to indicate how much water you've taken on? I agree there needs to be some sort of indicator. As it stands right now, if you fill the tank to capacity you create a dangerously overweight condition. The helicopter can loose the ability to lift that weight if pushed to hard or fast. There is already the slider in the GUI "Equipment/Fuel and Payload" under Payload - Load that you can watch so another GUI display wouldn't gain us that much other than maybe a bit more customized to the task. What I really want is a 3d cockpit instrument gauge that would show the status of the tank level and the ability to superimpose that gauge over the screen, maybe activated when the snorkel or skimmer touches the water. I think that would be ideal. These are the little details that are time consuming to create but would add so much immersion value to the simulation. I'm keeping a list of all these good ideas an hopefully can knock them out eventually. My first priority is getting the basic cargo towing in place (it's really close). Then either I am going to have to tackle some kind of sophisticated autopilot on my own or get someone to help me with it. I think it will be the most important "next step" to do. I envision an autopilot that can be controlled from the rear facing engineer station. Something that can be handed off from the pilot to the engineer so the engineer can direct the aircraft over the task at hand. Imagine the engineer working with the ground crew to assemble say a tower or wind turbine on top of a tower. That is the next simulation I'm looking to recreate. 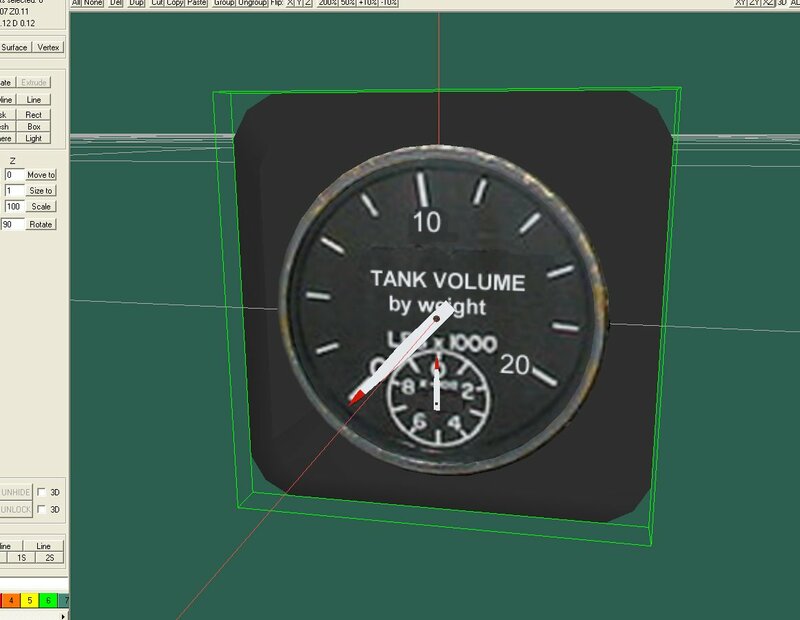 I suppose I could cobble together some sort of gauge or select a red light linked to the sim/models/firetank property for volume? 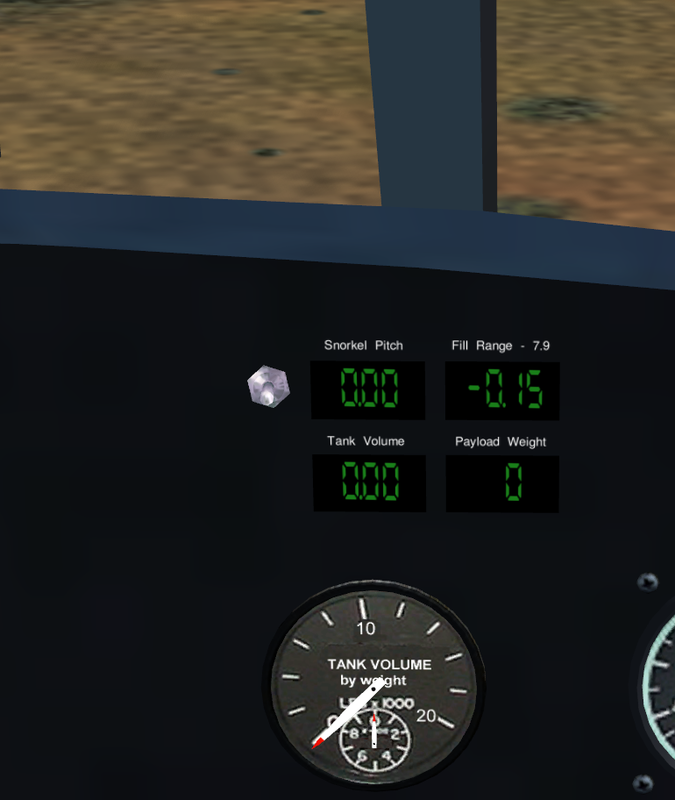 If you make a gauge for the cockpit panel, I'll create a GUI pop-up to display it during the tank fill. In the meantime, here is video demonstrating the main concept that inspired the creation of cargo hauling capability. I have to thank you @LesterBoffo for helping me to catch and fix two mistakes that crept into the code. The first was the use of airspeed VS ground speed as a condition to fill the tank. The second was the time it takes to fill the tank. Originally the tanks fill logic was on a timer that cycled every .25 seconds and since had been changed to something substantially faster so the tank fill was way to fast, the release also. As soon as I push the correction it should be back to where it was suppose to be. No problemo Will it's a nice new addition to the old Aircrane and I was trying it out killing hotspots in the Napa Valley inferno, Lake Hennesey is challenging to get a good fill from using the ram pick-up tube when there's gusting wind. It's too bad there can't be some sort of way to link present online wildfire mapping to placing wildfires in FG's scenery. You're aware that a good 60% of the forests around the Napa valley and Santa Rosa area, including a lot of the townships, small towns and part of Santa Rosa itself is on fire right now? Would a regular round analog gauge suffice? First let me preference this with the following, I prefer all my work to simulate realistic instruments and equipment that are actually used on the aircraft. I have search for awhile now to find a picture or documentation showing this instrument panel. I have a good reference for the panel that controls the deployment of the snorkel and sea snorkel (skimmer) and for selecting the dispersement platform. But nowhere can I find any gauge or idiot lights, nothing that deals with the level in the tank. There is an analog style gauge in the rear facing engineer station but I can't tell if it is tank fluid level or something else. In that same station there is a panel that looks like it might be an abbreviated version of the front panel that controls deployment and dispersal, it has some of the same looking colored light indicators. Being logical about it, if I was designing this I would have the fill controlled by computer that could be set for a specific weight or amount with an indicator light when the predetermined level was reached. 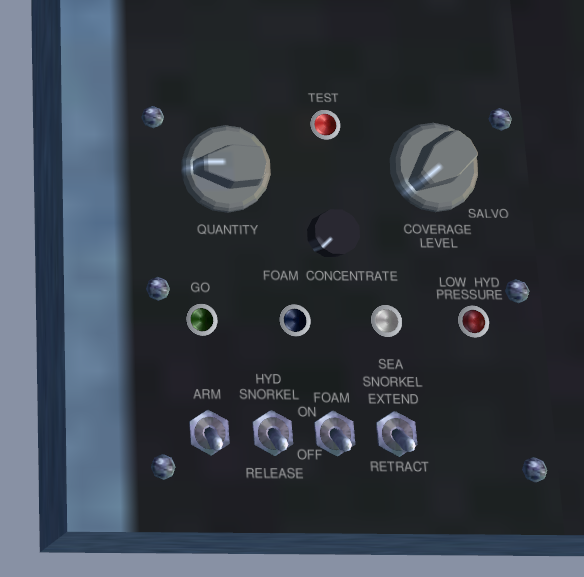 The computer would control the close valve. That is somewhat similar to what the dispersal logic and equipment currently does. As far as indicators for the hose or skimmer depth in the water. I can see convenience as a reason to have such indicators but I can also envision that being a function of piloting skills using the standard aviation altimeter equipment. To answer your question though, yes, I don't think we could go wrong with that type of gauge, but I can't verify that there is any such gauge or even an indicator light. You're aware that a good 60% of the forests around the Napa valley and Santa Rosa area, including a lot of the townships, small towns and part of Santa Rosa itself is on fire right now? Yes, I am a native of Southern and Central CA with family in the south that live in high threat areas. I constantly watch the fire hazard in that part of the country. I too have been putting the AirCrane through its paces putting out fires in the chaparral country in the south. We had a really close call to our property in the last couple years. The fire burned maybe 10% of our land one year, but no structures. Could have been a disaster. Will, do you have the revised tankoperations.nas pushed to your archive? do you have the revised tankoperations.nas pushed to your archive? Some work on the tank system panel. A couple updates pushed today. New water cannon hydraulics. I read the cannon has a vertical range of 15% controlled by hydraulics. I modeled the mesh but still need to model the animations and system code. On the quantity and coverage logic there is still a bit of code to write, but most of it is in place. I also read something about a tank volume indicator. Some docs indicated there is a digital display of the volume remaining in the tank. A digital display in the cockpit indicates the remaining volume. Pushed a couple additions yesterday to the tank system.